Anyway, people must doubt, but its our responsibly to prove them wrong. In a few minutes, we would implement the widget to help us pick our winner for the day. The person with the highest numbers of comments at the top of the widget becomes our hero of the day, and would get his or her 10k alert first thing tomorrow morning once we have the person's details. 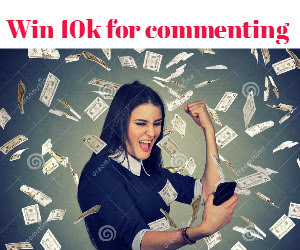 Pls if you didn't win, that doesn't mean you should get angry and stop commenting oh, lol we all know this is not about the money else we would never be able to pay for your time with us; so pls pls pls pls, help us congratulate the winner and lets all hope for the best ahead. Even if i win or not am here to stay.. i really enjoyed myself today while reading and commenting on this great blog.. Love you ma!! I surely enjoy this blog.. All the time I used to spend on nairaland each day was spent here today but it worth it. I hope my 2-day vigil will not be in vain. pls if let us know when see the widget, the network is so poor here now.